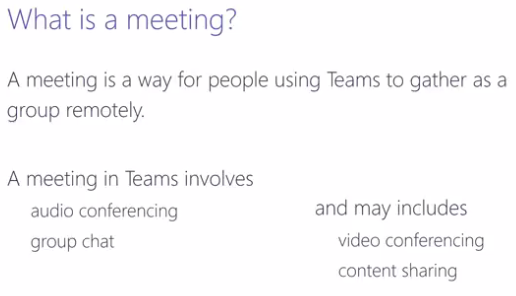 Having a look over the Microsoft Teams documentation and practical guidance site i wanted to see if there’s any new videos and i spotted a couple i haven’t watched on Audio Conferencing so wanted to give a summary of the video. First up is the introduction to Audio Conferencing in Teams, if you were familiar with PSTN Conferencing with Skype for Business Online its the same thing but the name has been change to Audio Conferencing. Also in the video it refers to Audio Conferencing as dial in conferencing as well which is the same. Here we summarize a meeting as Meetings in Teams is all about people together remotely to chat about anything. Teams meetings involves audio conferencing, group chat and can also have video and sharing. But you use any one or more of these during your meeting. 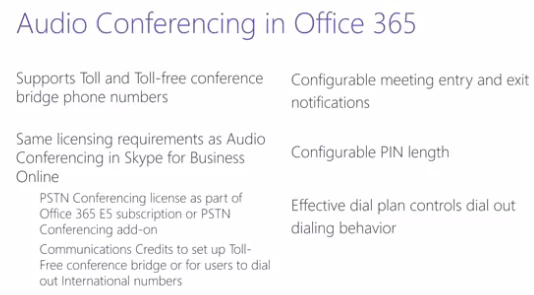 Also the video mentions to notice and pay attention to the Lower case use of audio conferencing WITHOUT the capital A and C which is official in Office 365. The audio conferencing (lower case a and c) part in Teams meetings serve function to enabled conversation to use voice and typing long messages as instant messages. Meetings can also include chat to all participants. Screen sharing help discussions for topics where people would also like to share content and people can relate to what’s being discussed. Meetings in Teams can be scoped as Private where meetings are known to specific people who were invited or can also be scoped as a channel meeting. Channels meetings are shown in channel meetings and people can see meeting in progress and can join. So what is Audio Conferencing in Teams ? Audio Conferencing is formally known as PSTN Conferencing Or commonly known as dial in conferencing. They all refer to the same thing which is the ability for a meeting to include participants that are able to dial into the meeting by the PSTN using a mobile phone, landline from home or office / PBX phones. Meeting invites have a conference bridge telephone number people can call and join the meeting. Organizer can also dial out to participants telephone numbers for them to join the meeting as well. Dedicated numbers but your tenant only. To set up and use toll free and to provide dial out internationally you need to set up communications credits or formally known as PSTN Consumption Credits. Conferencing bridge and Audio Conferencing service can be enabled to have entry and exit announcement to join as authenticated caller users will have to use their pin to join the meeting. Dial out usage Audio Conferencing support the use of effective dial plans, the combination of service and if applicable tenant dial plan. to dial out users can use preferred dial in behavior and not having to dial full E164 numbers to dial out. 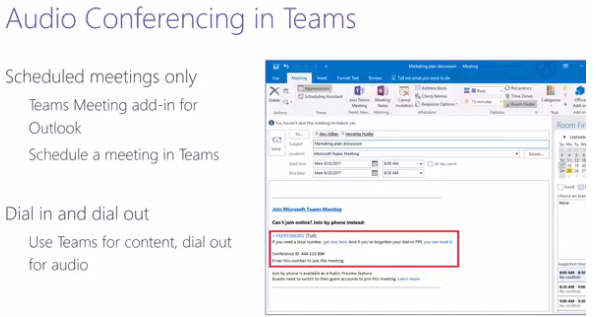 Currently in Teams the use of Audio Conferencing in Teams is for Scheduled Meetings only ! If you prefer to schedule using outlook you can schedule using Teams meeting add in for Outlook the conference bridge phone numbers associated with organiser and conference id will be added to the invite. You can also schedule directly in Teams, in this case the conference bridge phone numbers and id will be added after sending the meeting invite. As meeting participants users can choose to dial in via conference bridge telephone number or via Teams or use the Teams client and use the dial in prompt to via the meeting via PSTN. You can view the meeting content in Teams in this case and audio via Audio Conferencing functionality. In order for PSTN callers to be admitted as authenticated callers they need to use dial in conferencing pin. Usually set out when audio conferencing licence is applied and sent to users. Users can reset pin if forgotten. 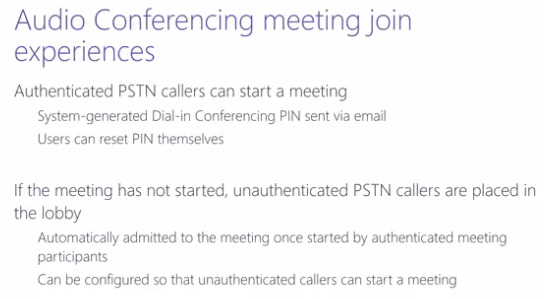 If you wish unauthenticated pstn callers can be enabled to bypass lobby to automatically start a meeting.